I paid a visit to the 55 Diner in Llanddulas this morning. It was originally built as a Happy Eater, then became a Little Chef. When Little Chef entered one of their periodic states of financial crisis, this branch was closed down and it remained empty for a while. Then a local businessman took it over and reopened it as the 55 Diner. 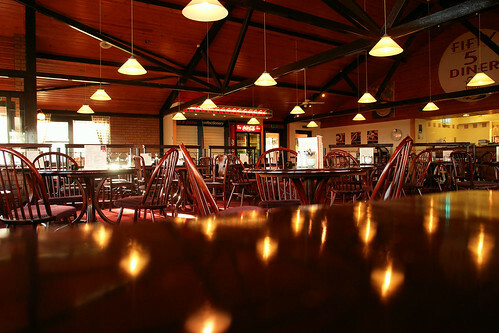 I've been here many times and the reason I visit is simple...it offers first rate food and drink at a reasonable price. When I was leaving today, I heard another customer saying that they had been really surprised at how good their food was, much better than they had been expecting. It's a world away from the half hearted attempts at food and service provided during its Little Chef days. People often ask me where exactly it is. It's next to the Shell petrol station at the Llanddulas interchange of the A55. You head for the petrol station and, at the entrance, turn right down a road into the 55 Diner car park. Not the first time you have reported on it either! The 101 is under new ownership - £4.80 for two coffees and a very small toasted teacake! I believe in supporting well-run local businesses such as the 55 Diner, so will continue to publicise them and others whenever I can. Not been to Cafe 101 for a couple of years; I did see it was for sale. Just to add to the praise for the 55 Diner - I also use it and I also think it is great. Even though they do not have any local competition they have not let their high standards slip! Long may they continue to serve us. I have refused a couple of comments about an individual called 'Craig Ollerton'. Suffice to say, I have no interest whatsoever in this person and could not care less what he does. No further comments about him, please - they will not be published. Oddly, I called in at the 55 recently, and was pleasantly surprised. Glad others think the same! Oh dear, can't the saga of Mr O end sometime? This century, perhaps?